Last Saturday as part of our Q Hotel ambassadorship duties we were lucky enough to stay at The Midland Hotel Manchester. This was our first visit to Q so we were excited but nervous about the task ahead. Now I would imagine the Midland is one of the most grown up hotels of the Q family, It first opened its doors in September 1903 and is every bit as grand now as it was back then. On first impressions the atmosphere in the reception area was just amazing. It was very grand with a huge tree and with a pianist playing festive tunes, It felt very special. Check-in was easy, there was plenty of reception staff available and although it was busy, we did not feel we had to wait or were at all rushed during the checking in process. Alex, the Lady that checked us into our room was efficient and very helpful. We then met Thomas the guest services manager of the hotel, who showed us to our room. Thomas told us about the Midland and a little about its history, and kindly arranged a pre theatre dinner for us. This allowed us to chill for a while, rather than rushing around trying to find somewhere to eat. He made us feel so at ease and welcome and even arranged our pre dinner drinks when we visited the bar later in the afternoon. Our room was beautiful and with the addition of a sitting area it was perfect for a family. We were able to relax and get ready for the evening at our own pace and did not feel at all cramped, in fact quite the opposite. 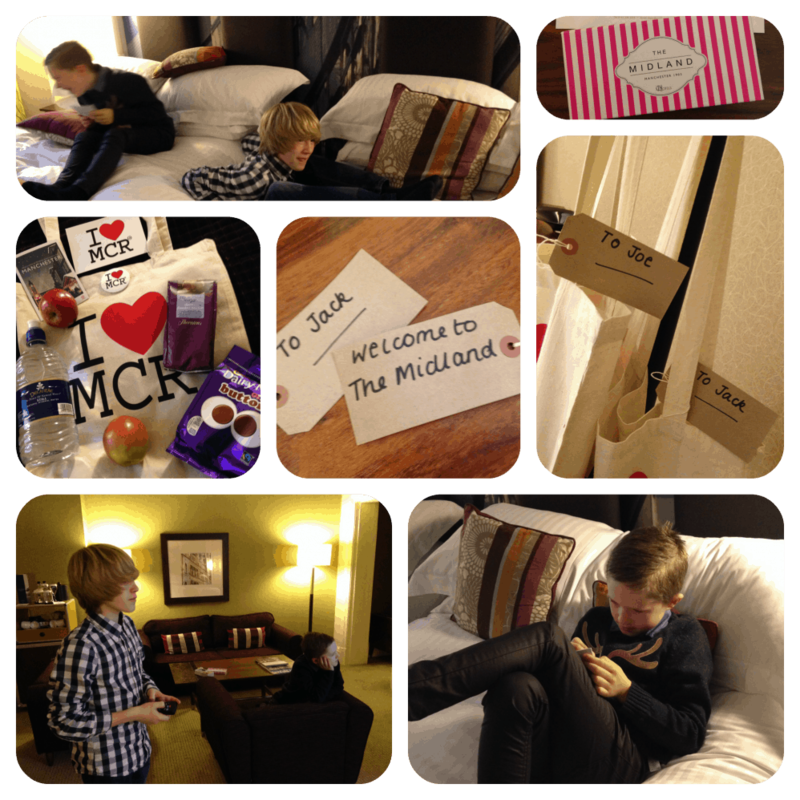 The Midland welcomed the Boys with a goody bag with some treats, fruit, water and maps of Manchester. They loved their goody bags and on this note; I would just like to say a huge thank-you for taking the time to arrange diabetic chocolates for Jack, it was just so thoughtful. We ate our evening meal in Mr. Coopers restaurant, which was wonderful, and deserves a review of its very own so watch this space. Breakfast was delicious, again it was very busy, but the lovely staff managed it very well, It did not affect the attentiveness of staff or service one little bit. We spent some time talking to Houriey the breakfast manager a lovely man and a real character, he kept the boys entertained discussing football. 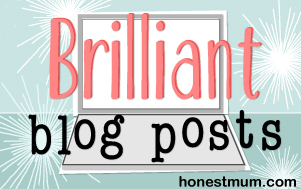 A subject, which is always welcome with all the men in the Christie family! He also gave us a fascinating insight into all the hard work behind a busy hotel breakfast service. I honestly never realised how much work and commitment goes into providing guests with a hearty breakfast. 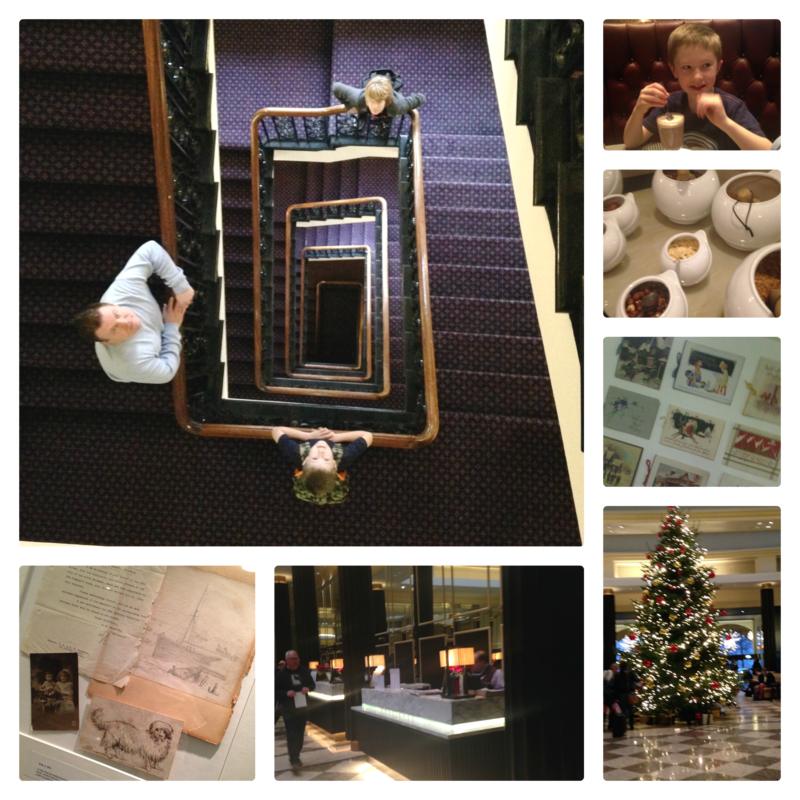 The Midland is in the perfect location for the Christmas Markets, it was, just a 2-minute walk, perfect for the boys, as we were able to nip in and out of the markets. It’s funny we have visited the markets for a few years but never taken the Boys, yet Manchester has so much to offer families. Firstly they were amazed by all the hustle and bustle of the Christmas Markets, and loved the variety of the stalls. The palace theatre was only a 10 minutes walk; so we were able to see Shrek, the perfect show for families. They also loved the atmosphere of Spinningfields with its street stalls and unique spaces like the Oast House, Helter-Skelter and Ice Skating Rink. There really is so much to see and do. Whilst we were enjoying our evening drink, Jack and I were discussing the Midland and agreed it reminded us of the Queen Mary 2, refined and luxurious yet friendly. Jack also thought the Midland wouldn’t look out-of-place in New York. So is the Midland good for families? Well, it certainly is a grown up Hotel. But it’s a grown up Hotel that welcomes families with open arms. The Boys loved the Hotel, our room, the food and the pool. The staff made us so welcome, and the location is just perfect, if your families, like my family are explorers, Manchester is a must place to visit. And if you do visit Manchester I can wholeheartedly recommend the Mighty Midland Q. 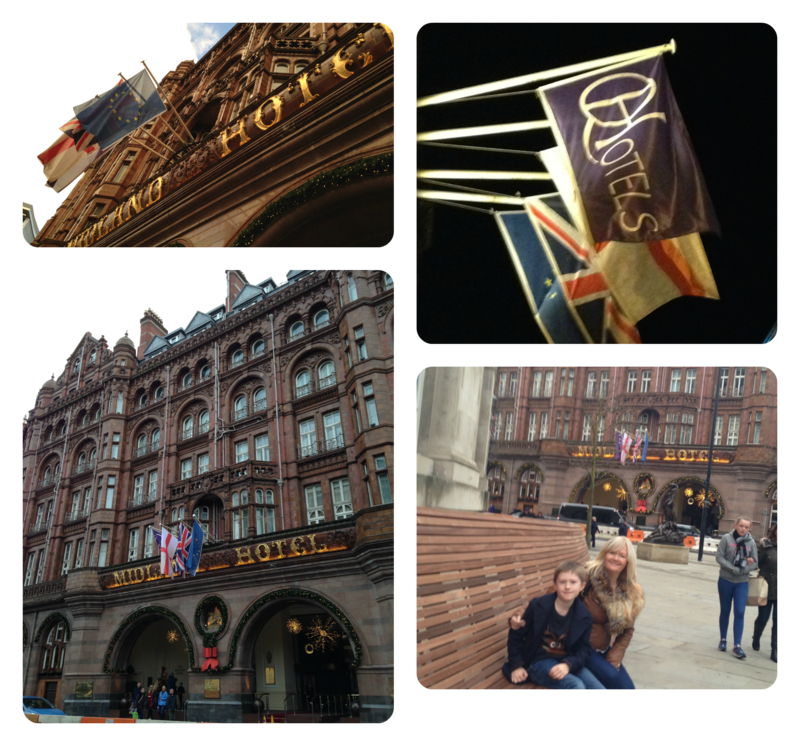 If the Midland was anything to go by we are going to have an amazing journey as Q Hotel Family Ambassadors. Great first review for Q Sarah. Fabulous photos too. 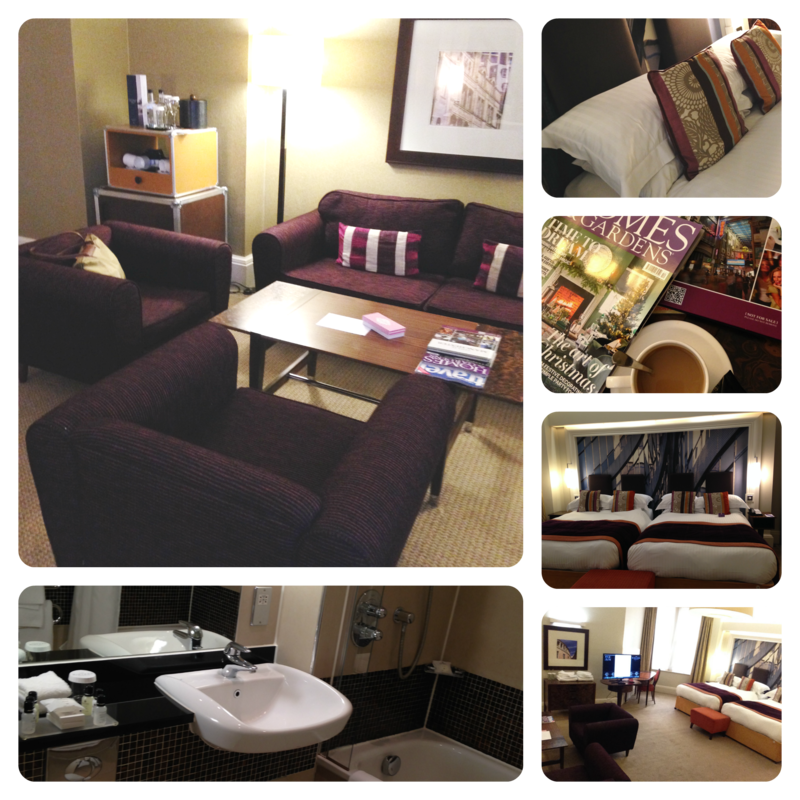 Love the Manchester Christmas markets and what a place to stay to enjoy them! Very insightful review, thanks for sharing. I’ve not stayed at one of their hotels but would love to. Thanks for giving us an inside look!